Daisy does not fit in, as the only grey, scruffy donkey in a stable full of beautiful camels she is certainly different. She desperately wants to repay her owner Saul, for all his kindness, but nobody wants to travel on a donkey, or do they? A wonderful traditional tale told with a modern twist, a must for children of all ages. This, Russ’ first published book, was short-listed for a B&N children’s indie author prize. 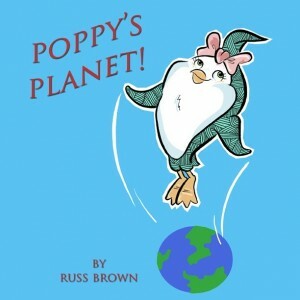 Poppy’s Planet! tells the story, in rhyme, of a magical flying penguin who sees the damage and destruction caused to our fragile planet by man. She discovers that although she is only small she can make us all aware that we can save the Earth. Poppy takes from her bed at night to circle the Earth to witness first hand the effects of man. A beautiful and thought-provoking picture book which deals with the sensitive issues of the environment in a child friendly way with illustrations by Jamie Cosley. Really enjoyed this book, it is very informative for youngsters and could be used to cover different areas of the curriculum.